Lang students have a history of mentoring. Here two students work with the I Have a Dream Foundation. Photo by Andrew Smrz. This fall, a small group of undergraduates from Eugene Lang The New School for Liberal Arts will spend about half their week in public housing. The students, part of the class Youth Mentoring in the City, are working in conjunction with the Cornerstone Mentoring Program, which is itself part of the City of New York’s Young Men’s Initiative (YMI). 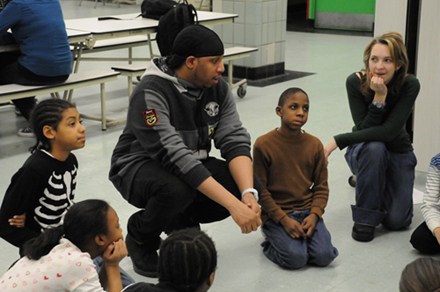 The YMI attempts to address the particular needs of at-risk youth in New York. It’s pet project of Mayor Michael Bloomberg, who contributed some of his own money to its three-year, $127-million budget. Through their work, Lang students will help shape a program that serves 300 New York City youth in grades five through nine. The course is Cornerstone’s first partnership with a university, but a continuation of Lang’s long history of working with outside organizations which foster engagement with New York City youth. Spanning two semesters, Youth Mentoring in the City mixes classroom learning with on-site mentoring at Cornerstone Centers, activity hubs located in public housing facilities throughout the five boroughs. New School students will work with their mentees to develop community service initiatives to be launched in the spring, helping them establish healthy relationships with adults and a service ethic in the process. Isa Wong, a Lang student in the course and a New York native, isn’t taking it out of idle curiosity. She has a personal commitment to mentoring; in her life, she had already seen too many people “head down the wrong path,” as she put it. In fact, she was one of them.